fishing activities (depends on weather/tidal waves). Pick up and Drop from Hotel/Residences. Drive past Oil Refinery, Visit to Sheikh Zayed Mosque, Visit to National Exhibition Centre, Emirates Palace Hotel, Photo stop at Sheikh's Palace, Heritage Village, Marina Mall Visit, Abu Dhabi Corniche, Carpet Market, Drive past Ferrari Track. 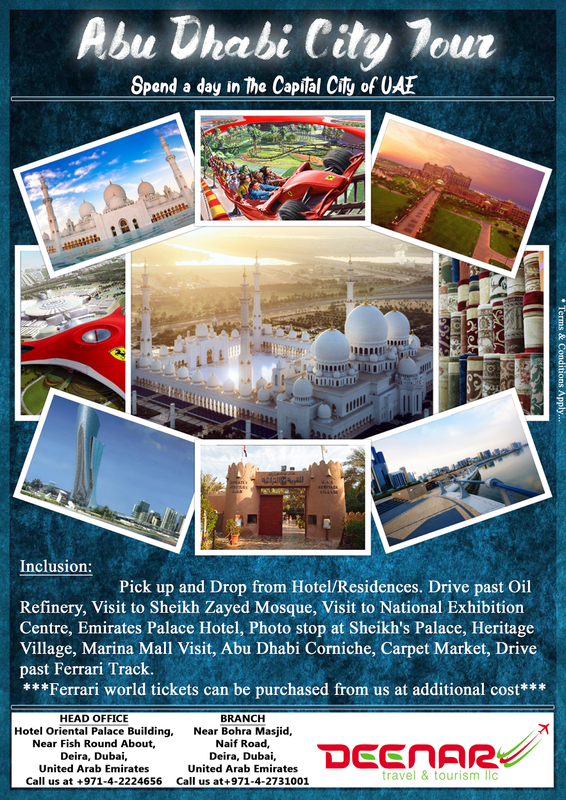 "Feel the joy in exploring the Majestic Capital City Abu Dhabi"
A must for everyone who is visiting UAE. A memory to share with your family and friends back home, This is one safari you can't do back home. We recommend it highly and it will be worth every penny spend ! 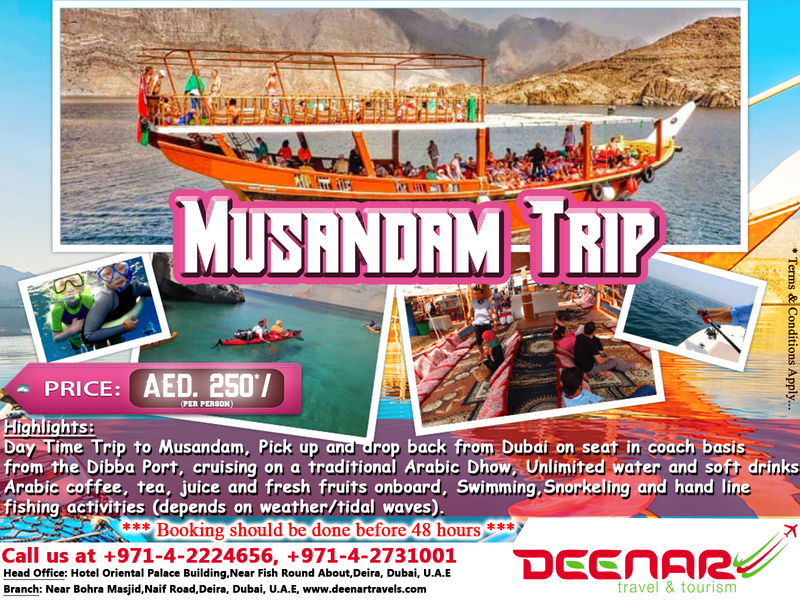 This tour departs in the afternoon across the desert of Dubai with several photo-stops during an exciting dune drive to the first destination a camel farm. The drive continues across the desert. We stop to watch the beautiful sunset before reaching our campsite where you have the opportunity to do a camel ride, sand boarding and try out a henna design on hand or feet. After working up an appetite enjoy a delicious barbecue dinner and shisha (the famous Arabic water pipe). 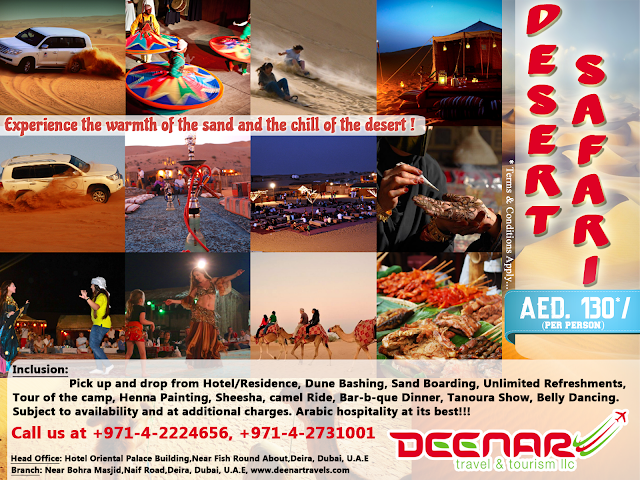 Before returning to Dubai/Sharjah watch our belly dancer performing her show around the campfire by starlight. Experience the Warmth of the Sand & Chill of the Desert with Us. 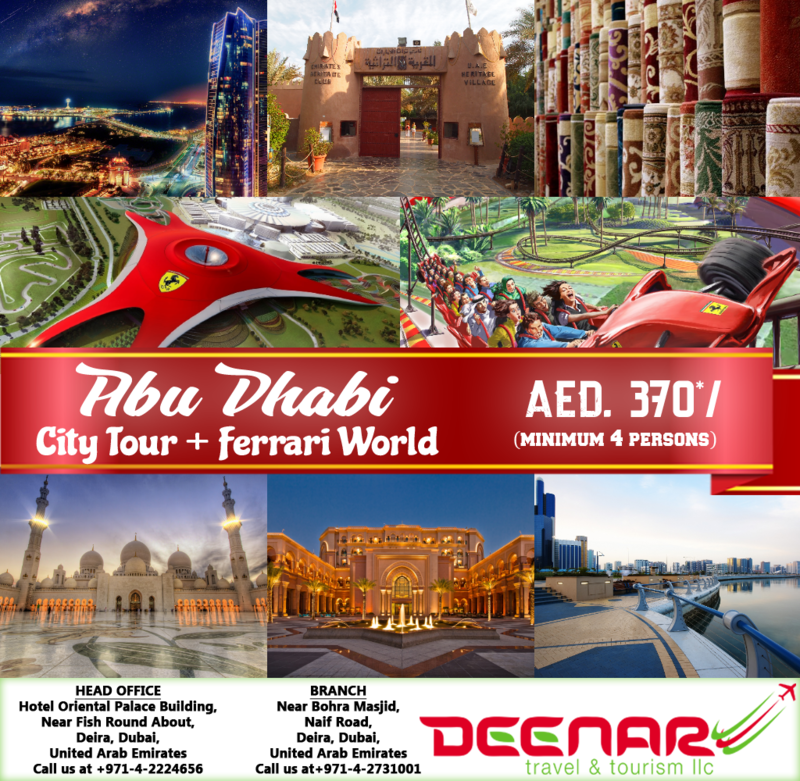 Deenar Travels offers a comprehensive range of travel solutions catering to individuals and families in the UAE and Oman, ranging from exciting holidays to unforgettable honeymoons, and from golfing experiences to group cruises. By combining our specialist knowledge with our global network of partners, we offer the finest travel experiences around the world. Whatever the choice of holiday activity - adventure, sports, shopping or sightseeing - our aim is to ensure that it is perfect. And wherever the destination - city, safari, beach or mountains - we ensure best value for air travel, hotel stay, car rental, travel insurance and other needs. 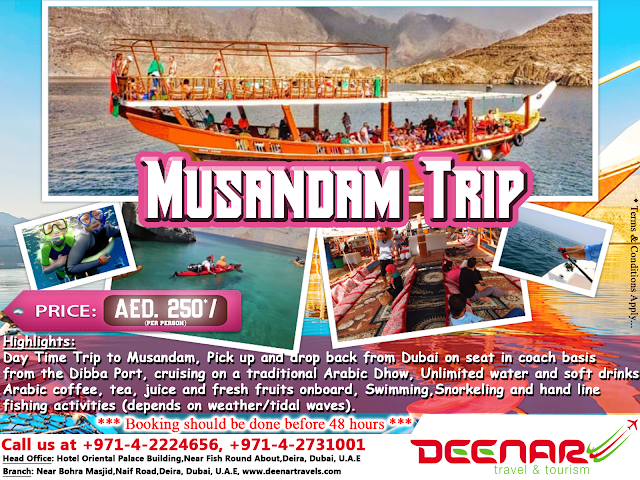 To provide memorable holidays for our customers for their stay in UAE and satisfying the needs of our clients and always exceeding their expectations. 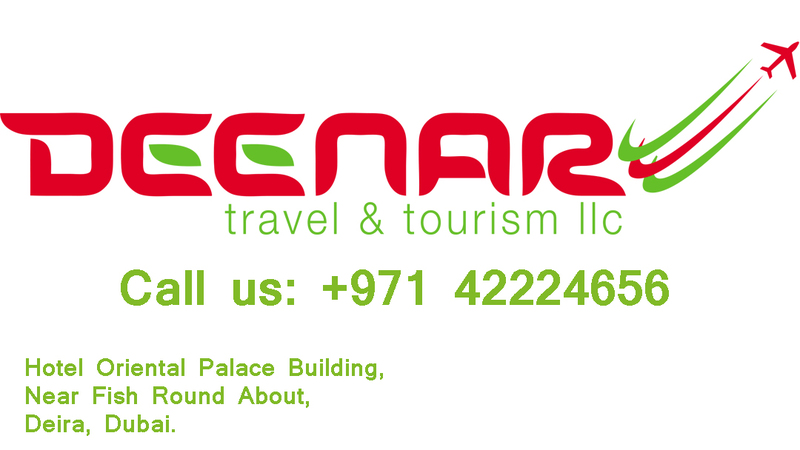 To become the leading travel agency in UAE and our clients’ best partner, always providing the best possible product, with the highest quality of services.